Gin Rummy is considered to be one of the most popular card games in the world. It is a variant of the card game Rummy – a variant of the Mexican game, Conquian. Unfortunately, the game isn’t as widely common as poker, blackjack or other card games but international players can indeed find it online and play for real money. BetOnline is the best place online to find Gin Rummy and the only site from our list of recommended sites – based on their security protocols and credentials – to offer the game. BetOnline was founded in 2004 and is considered to be one of the best all-in-one gaming sites, offering not only a ookmaker but casino games, poker, and other skill based games. You can download the client to your PC or Mac, or you can access the Flash games via your browser – Safari, Chrome, Explorer, and other browsers are compatible. New players can opt in for the welcome bonus of 25% of up to $1000 too. However, this can only be used for sports bets. If you only want to play Gin Rummy at BetOnline you can refer a friend and receive $50 to use on the skill based games – there’s an 8x turnover requirement on the bonus cash, which you will receive once the friend signs up and makes a deposit. Gin Rummy is a variant of Rummy and considered to be one of the most popular versions of the game. The title was created by Elwood T. Baker and his son, C. Graham Baker in 1909 after they felt the original version needed to be faster. Played with a standard deck of 52 cards, each are ranked from low to high starting at Ace, 2, 3, etc., and ascending to Jack, Queen, and then King. Ace is valued at one point, the numbered cards equal their face value, and face cards equal 10 points. 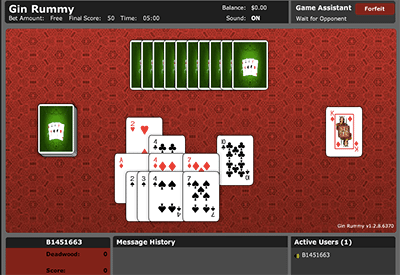 Gin Rummy sees players scoring an agreed amount of points before their opponent does. The set amount of points is usually 100. 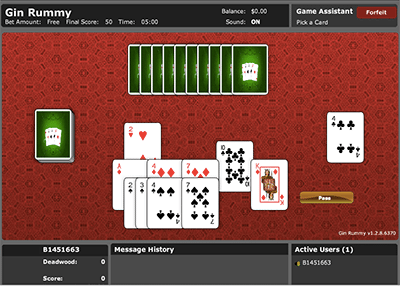 Players need to arrange their cards into spreads, with two kinds available – sets and runs. A set involves three or four cards with the same rank, such as 8, 8, and 8. A run involves three or more cards with the same suit running consecutively, such as 5, 6, and 7, or 10, J, Q, and K. You can’t use one card for a run and a set at the same time however. Players are each dealt 10 cards and then the 21st card (next card after the deal) is turned face up to commence the discard pile. The rest of the deck is placed face down and is known as the stock pile. Additionally, a turn must be made up of a draw and a discard – you must take a card from the stock pile (face down) or the discard pile (face up) and discard of one of your own cards. Your opponent will know what the card is if you take it from the discard pile, but if you take it from the stock pile it is not revealed to them. To end a hand, you can knock. This can be done whenever you wish, even after the first turn – provided you have a hand which can form enough spreads. Simply do this by discarding a card and then revealing the rest of your cards. Any cards leftover which can’t form a spread are known as “Deadwood” cards and in order to qualify for a knock your Deadwood cards cannot amount to more than 10 points. If you manage to knock without any Deadwood cards, then you are going Gin and earn 20 extra points to your cumulative total. To check if you can knock press the ‘check knock’ button and it will display the Deadwood cards and the spreads possible. You can also add your deadwood cards to a player who has knocked without going Gin – drag your cards to their hand to do so. The game continues until a player scores 100 points – from knocking or going Gin. The basic strategy for Gin Rummy is to aim to eliminate Deadwood cards and and as such improving your own hand in the process. If your opponent discards a card which could help your spread, pick it up as soon as you can as the closer you get to going Gin or Knocking, the better. It is important to consider high value cards can also be high Deadwood cards, so if they can’t form a set or run discard of them quickly. As such, middle cards are considered to be the most valuable, including a seven as it can go at the end of a lower consecutive run or at the start of higher valued runs. So try not to discard of middle cards, especially sevens, too early in the game. Overall, aim to go to Gin or Knock as quick as you can. Play Gin Rummy online for free fun, practice or real money in your local currency at BetOnline.com.